Recently I was in the Hub when one of those reality TV dating shows was playing. Not The Bachelor, but a copycat program. 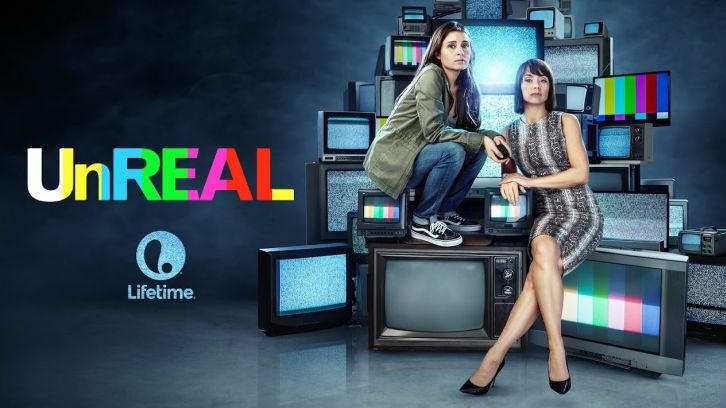 I watched a few minutes while I ate dinner, and it reminded me of a show I’d heard of somewhere: UnREAL, a scripted drama about the making of a Bachelor-esque reality TV show. I ended up marathoning two seasons within a couple of weeks and becoming deeply, emotionally invested in the nuanced depictions of two women working an outright hellish job. UnREAL is the brainchild of Sarah Gertrude Shapiro, who spent three years working on The Bachelor franchise. The scariest thing about watching UnREAL is wondering how much of its darkness and manipulation is drawn from her own experiences. UnREAL opens with its protagonist Rachel Goldberg, played by actress Shiri Appleby, in a limousine filled with contestants, staring blankly up at the sky while wearing a t-shirt that says “This is what a feminist looks like.” Throughout the show, Rachel will claim that she’s working to make it progressive, to create valuable media with social justice messages. But how much of this is true and how much of it is her way of justifying her work? Doubt sets in early when her contestants are repeatedly told they must stay in the limousine, even as they pled to be let out to use a restroom. Eventually, desperation sets in and they flee the car to squat on the grass, still wearing their ballgowns. We soon learn that Rachel’s only recently returned to the show as a producer and that her return is controversial. When she first walks onto the set, a crew member shouts that “crazy’s back!” an offhand reference to what we learn was a devastating emotional breakdown that got her booted from the show. Rachel might not have returned at all if it wasn’t for Quinn King, the executive producer played by Constance Zimmer. Quinn treats the contestants of her show, Everafter, as living props to be manipulated. And in turn, she manipulates the producers working directly beneath her, encouraging them to get contestants to cry or fight on camera. Although she doesn’t seem to care much for the contestants, she does seem to care about Rachel. She thinks she knows what’s best for Rachel, and it’s to shape for Rachel into a miniature version of herself, heartless and calculating. At the same time, it’s easy to feel some sympathy for Quinn. She invented the whole idea of Everafter, only to have it stolen from her by a male co-worker, who’s now her boss and lover. She’s constantly overlooked and derided, allowed to rise but never too high. There may be some truth to her belief that a woman in a male-dominated industry has to be cutthroat to succeed. It’s when Rachel’s mother is introduced in Episode Four that we begin to get an even clearer picture of the dynamic between Rachel and Quinn. Rachel’s mother is a psychiatrist who’s insisted on treating Rachel herself, prescribing her with a long litany of drugs and disorders. In juxtaposition to Rachel’s mother, Quinn is practically maternal. It goes a long way towards explaining the underlying mother/daughter dynamic in their friendship. In another show, Quinn might be made into straightforward villain and Rachel into a heroine. But UnREAL chooses to let them both be complicated women whose lives are morally gray and messy. Neither of these female protagonists are exactly likable, and that’s what I love the most about UnREAL. It doesn’t demand that its female protagonists sand off their rough edges to be palatable, and it doesn’t insist that either is all good or all bad. Rachel and Quinn exist within a male-dominated realm in more ways than one as they break ground as female antiheroes.